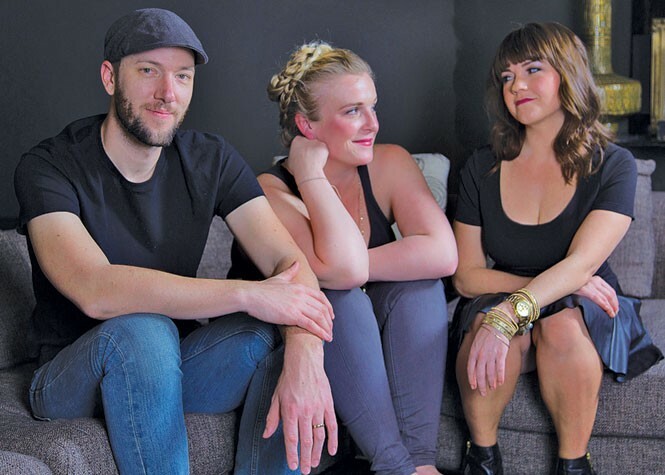 The sophomore album from the Salt Lake City vocal trio Bullets & Belles, Ready, could be described as doo-wop-ier, folk-ier and tighter. "It's a grown-up album," says band member Noel Sandberg. "We've gone from whistling to kazooing." The album represents their "Saturn return"—an astrological cycle that represents "this big shift that happens ... when you turn 30 ... Inherently, [because of] our ages, I think it's just a time of reckoning," says band member Erin Haley. Life has shaken up considerably for the band since the release of their debut album, Be Glad: Haley and husband/bandmate Ryan Cron found out two weeks after that album dropped that Haley was pregnant, and the anticipation of having a new baby drifted into the songwriting—along with the fear of responsibility and the question, "Are we ready?" "One of the big [ideas] of the album is that nobody does know what they're doing," says Haley. As the band has grown and matured, they have come to terms with the idea that people who always seem ready for all of life's events are, much of the time, putting up a façade—and it's OK not to feel ready. The album serves as a reflection of, as Haley calls it, the "harsh, but beautiful, reality that everybody is winging it." The title track delves into that fear: "I don't know if I'm ready/ To watch them endure/ The world and its muses/ So destructive and unsure." Haley wrote the song just after the Boston Marathon terrorist attack in 2013, which brought a weight down upon her. She remembers thinking, "How much worse can this be?" The lyrics of "Ready," a mostly acoustic indie-folk tune with a low-key, swinging chorus, reflect the terror and vulnerability Haley felt at the time, bringing a child into a world she couldn't explain. "I don't have the answers to how dark it is. I don't know what's going to happen," says Haley. Much of the album was written while Haley was pregnant, and she struggled to avoid writing only about that huge life change. That's how "Falling Through Space," a light, bouncy track with a stronger folk pull, came about. The three band members all contributed to writing it, broadening its meaning. "I want to be honest with my feelings, and my feelings are overpoweringly about having a child, but we came together and said, 'Can't it just be about love?' 'Falling Through Space' is about the fear of embracing love. It's the one song that I think covers both of those spectrums," says Haley. The group decided to have Sandberg sing "Falling Through Space," because the narrative differs from the theme of preparing for parenthood that was such a focus for Haley and Cron. "The song is about love, but I don't necessarily think that it speaks only to love," Sandberg says. "I interpret it as the act of taking a risk or leaving your comfort zone without necessarily knowing what the outcome will be, and how potentially terrifying that can be, but also liberating and rewarding." All of the songs are in some way self-referential. "Someday You'll Understand"—which began as a track to fill the album's need for a "dance-y" song—is spare during the verses, with light drumming and a heavier walking-bass groove under Haley's jazzy vocals, until the chorus when the other two join in on '50s-era harmonious doo-wops. Haley wrote this song about the struggle to learn what it's like being treated unequally ("I thought we were the same/ Until I carried/ A child in my belly/ Reality has set in/ Now they see me as a mother/ And he still gets to be him"). Cron, a "die-hard feminist," doesn't subscribe to traditional gender roles, and while Haley gets peppered with questions and advice about raising their 2-year-old—or is asked where the baby is—such questions are never directed at him. "Having [our baby] really opened my eyes to the inequality that thrives in society still," says Haley. There is no question that both Haley and Cron plan to keep the band a priority, even as they raise their daughter. "We don't have a choice. We can't not do it. I just have to, to function. I'll never not do it," says Haley. They are used to splitting responsibilities, anyway. When Bullets & Belles play live, they have the percussion and drum-kit roles divided: Sandberg on snare, Cron on kick, and Haley on keys. (For their upcoming album-release party, hosted by The State Room, they hired a drummer with a full kit). All three contribute vocals, rotating on lead, while Cron plays guitar. Each has his or her vocal strengths. Sandberg represents the country elements; Haley, doo-wop; Cron, blues. The blend keeps the band from being easily pigeon-holed—a fate they have had the freedom to avoid as they produced the album on their own label, HeyHay Productions. Two of the tracks—"I Never Loved You" and "Big Magic Eraser"—were recorded live, reminiscent of mid-'50s operating procedure before the prevalence of multi-tracking, because it captures the "old-school sound," says Sandberg. Saturday's concert kicks off a national tour, but there's another major life event awaiting them at the end of the summer: a planned relocation to Portland, Ore. Haley and Cron are moving because of Cron's new job; Sandberg is moving because that's where the band is going. It's another big change, but as Sandberg says, "That moment when you decide to take a risk and do something scary, that's relatable to everybody."